The mating is the most important breed technical job. We must plan our future breeding pairs in the winter who deliver new generations and who by preference surpass our expectations. I don't believe to err when I state that of the total breed technical job, we prefer to be occupied with this work; the work that gives us each year new hope. "First we must get rid of an old opinion, most fanciers don't let go. Namely that one must breed out of all pigeons one has. And precisely this, one must not do". 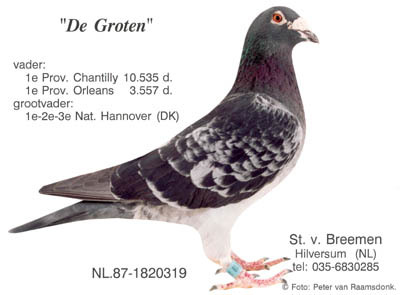 "De Groten" was bred out of old concentrated Desmet-Matthijs lines all going back on the best breeder of the century "De Oude Klaren '46" of Desmet-Matthijs. "De Groten" won a handfull of firsts and produced two Provincial winners. He is also father of the hen to produce for John Engel & Arne Porsmose in Denmark 4 birds to place themselves on the first 4 positions in the '96 National Hannover race. In my opinion, one must not take that to seriously in the pigeon sport. First because in the competition sport, be it race horses, pigeons or greyhounds, many unforeseen things are manifested much more so than in the case of other domestic animals. At one time or another, we have all had a super flyer or an extra passer-on in our hands because by putting the parents together, one could count on everything but class pigeons. It will soon be 40 years that I have bred pigeons. Without let up, I have striven for years to arrange the best breeding pairs by means of a painstaking analysis and careful consideration. I am not ashamed to conclude that despite all this, I have often met with big surprises. It often happened that out of breeding pairs I expected the most from, not one good young arrived in the world. And again out of other pairs I expected nothing from, celebrities were born. From this I drew the conclusion that if that happened in my loft, it will also happen to the less skilled fancier. And if that is true, we decrease our chances when we reduce our breeding population to the "for-our-purpose" best individuals. There are a few things we can be sure of in the pigeon sport to significantly increase our chances with what we have learned in the preceding articles. The correct way is to continuously reinforce our population, in the first place with respect to character such as mordant, speed, intelligence, muscle quality, pupil size, iris pigmentation and the weightlessness of the body structure. We can never have enough pigeons in our loft who can answer to these characteristics. When we have consciously brought these pigeons together and on a high level, we only need the correct crossing combinations so that the first generation can dispose over a plus with respect to vitality, taxation capacity and all related characteristics to being in good form. All this increases the chance for a championship. We must dissect the qualities of our pigeons before mating!!! It is far from sufficient to bring "good with good" together in mating, or to try improving an average pigeon with a good pigeon to obtain a better quality. Whether a pigeon is good or average is not so simple. It consists of many factors. A pigeon attains superior results because her intelligence is well above the average and that is within her own performance capacity the deciding factor. With another pigeon again it is her teeth grinding mordant which stimulates her to a performance well above her powers. The above mentioned characteristics are not in significant doses to be found in other pigeons, but she can more easily cope with the heavy burden by her super vitality than the others who don't have anymore reserves at a given moment. But in fact they are all "good" pigeons. I would like it that finally fanciers begin to realize that good and GOOD are far apart. When we think about it, we must understand that how we mate is not at all the same. We must thoroughly analyze the positive as well as the negative characteristics of our pigeons. Evaluate them independently of each other so that we can make the best mating by this. Of course we must also keep the exterior circumstances in mind with the dissecting of the separate qualities of our pigeons. At what distance, under what weather conditions, and against what competition the pigeon had her best success and what prizes she won on other races under specific circumstances. When analyzing in this manner one meets thousands of variations. The fancier who passes this has little chance to breed better young pigeons. On a race from Compiegne (360 km) in 1990 the first prize in our Province was won with a speed of 2100 meters per minute. That is likely a national record. May one therefore stamp this pigeon as especially fast? Doubtful. There was such a strong wind during this race that the arriving pigeons could hardly fall inside the loft. The next day the weather conditions had completely changed. The pigeons had to work hard for a prize. The winning pigeon of the previous day, perhaps might have been without a chance here. Bad weather, rain and head wind are circumstances from which pigeons return more tired on a race of 300 km than from an easy race of 500 km. Fanciers are advised to pay attention to each separate competition race and register all remarks about it. Of course those pigeons are the most valuable for breeding who with bad, rainy weather or with head wind and heat are better than the others, but who perhaps don't stand out in races where prizes are won within a few minutes. For me, the most valuable races are those where the first prize is won with a speed of around 1100 meters per minute. Those are the races where the winning pigeons must mobilize all their mordant and all their body reserves and where weaker pigeons don't have the power anymore to pull through. Race results with a high speed have little value for me from a breed technical point of view. The bad ones do not stay behind as it was not heavy enough. And the manner in which the prizes are rewarded is decided by the fast course. Important matters with regard to the planning of the mating. What are, in the final analysis, THE factors with respect to the planning of the mating? 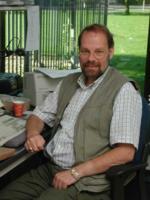 d. The combination suitability of the line and the quality of the pigeons who came from it. Earlier I have already dealt with the ancestry. It is sufficient when we have the details of the first three generations with respect to the future young pigeons. The heritage must not be our only purpose; we don't breed for the sake of heritage, but we try with its help to improve the quality of the following generations. When specific characteristics are absent from our pigeons, the heritage alone will hardly help us further, never mind how famous the names may be. I also wrote about the individual performance. One must always look at this separately and not evaluate in a general way. The talents of the next generation are a wealth of information. First to what extent can we rely on the passing-on, or to what extent did luck or accident play a role. When good performing pigeons can be found among the closest family members, it is a good sign of course. Precisely because of this, one cannot thoroughly enough investigate the family relationship of strange pigeons. From pigeon to pigeon and even also from the pigeons in our own loft. The same applies to the combination suitability of our lines. There are crossings which show time and again good results and also combinations which seldom produce anything worthwhile. It is worthwhile when we keep this well in mind. The combination suitability shows in the quality of the young. Actually the evaluation of this quality is a sort of offspring control, but this has a different meaning in the pigeon sport than with other domestic animal types. From a breed technical point of view, the quality of the youngsters must always be better than is the flying quality of our breeding pigeons. "We recognize the tree by its fruits". A good breeder is always more valuable than a good racer because the former can give more good racers. With respect to the offspring control, I would like to say that the heritage has less value when it concerns the hereditary additive properties. Here the family relationship is less interesting because the breeding pigeon's additive qualities are passed-on by an intermediary. Therefore it is important what the breeding pigeon herself has to give; not the value of the family members. That's why it is sufficient in this case to only use our own eyes and hands. Mating is a sort of strategy; a musical instrument. The tune we wish, can be determined by ourselves. Each note corresponds with a specific key. Another key doesn't give the right note!